Have eaten in Kathmandu Kitchen twice now and it is nice. Visually this is a dated restaurant and was chilly on my first visit but much warmer second time round. I found the food pleasant, but spice levels too high for my taste. Having tried mains of Chana Masala (chickpeas) and Vegetable Bhuna I found them much spicier than I would have preferred. 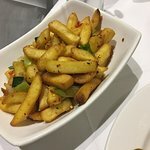 These usually are mild to medium dishes and indeed were marked as medium spiced on the Kathmandu Kitchen menu – but they were fiery hot. Also, be careful when ordering, as the vegetarian dishes sometimes seem to contain paneer – so if you are vegan you will have to be aware of this and specify no paneer cheese. Complimentary poppadoms were a nice touch. Had a delicious meal here last night. We were walking around looking for somewhere different to eat and just happened on this place. We had been trekking around all afternoon in the city doing some Christmas shopping so the prospect of a good meal in a pleasant restaurant was exactly what we need. Because it was quite early the place was quiet, with only one other table occupied, but it suited us perfectly. As the evening wore on, more diners arrived, and the atmosphere started to buzz.The décor here is very subtle and the lighting really sets the tone. The menu is quite extensive and we ordered a meat platter for sharing for starters, and two different chicken dishes for mains. Poppadums are automatically brought to diners in this restaurant – other restaurants please take note! We were tucking into them when our starter arrived. We would have preferred if the starter was served after we’d finished our poppadums, but that’s the only quibble we have with this place. The service was very good, non-intrusive, and the food was just super, we couldn’t fault it. There is also a very busy takeaway service here. 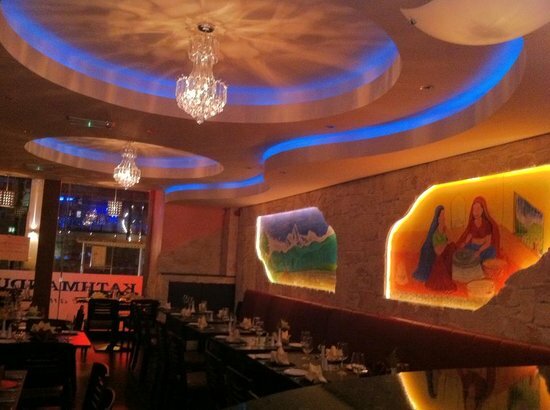 Overall, a very good experience – nice surroundings, lovely food, good service and very good value. We will be back. 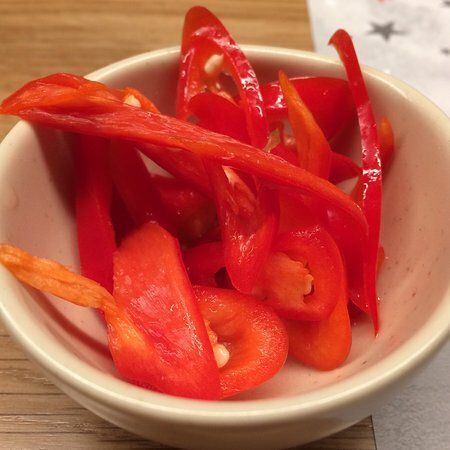 15/01/2019: While in the Victoria Centre doing a couple of errands, and remembering the pleasant experience I had some time ago at Wagamama, not just food wise, but also the friendly service that we were given, I decided to give it another go. And just as before a very nice waiter approached me and when I asked him whether it was all right to order just a child`s portion and when he agreed, I could not have been happier. Within a short period of time I was served a lovely warm bowl of Chicken Ramen with hot chilly, the latter not an ingredient that is normally part of the kind of food that I eat, so I didn`t eat those but left them in the soup for flavor. A small Japanese glass of beer called Kirin was a a nice accompaniment to the meal. Yes I would call into this restaurant again. 08/11/2018: After a wet day, decided to try Wagamama for a quick warm meal. The staff were efficent and friendly. The food was hot and succelent the bang bang cauli was hot and spicy its always a favourite. We had yaki udon, steak bulgogi both excellent the free green tea is warming the wine is good too. The restaurent was quickly full. A hood place for good quality, reasonably priced food. 17/01/2019: This place offers a main course lunch with boiled rice, fried rice or chips for two at just under £10 and it’s really darn good. 10/02/2019: We were late wanting to eat and it happened to be Chinese New Year so we phoned here to book a table - we were told they were closing at 10pm (was just before 9pm) and could have a main course only, which we kind of understood.